We looked at this block of West Pender from the other end in an earlier post. Here, we’re looking east and down the hill from Victory Square. 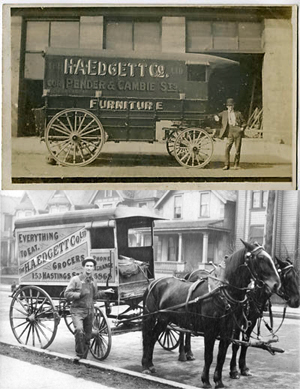 On the corner of Cambie Street is the Edgett Building, actually developed by Francis Carter Cotton and later used by H A Edgett for his wholesale fruit and vegetable company. Today it’s the home of the Architectural Institute of BC. Next door is a vacant site, soon to be redeveloped with a non-market rental building, but originally home of the Calumet, a rental building that may have been one of Sam Kee’s investment hotels, where he hid his ownership (as the building was outside Chinatown) by having the Building Permit submitted by his lawyers, Parkes & McDonald. Next door going east were two hotels, still standing today and operated as well managed privately owned SRO Hotels. The Silver was developed by W S Silver, and English born broker who lived in Burnaby (with Silver Avenue being named for him). Designed by Grant & Henderson, it was completed in 1914, five years after the Savoy Rooms, later the Avalon Hotel, designed by Parr and Fee for McLennan and Campbell. The Vancouver Public Library picture (above) was taken in 1912, while the one below dates from 1981, after the Calumet had burned down. In 1981 137 West Pender was still standing; a warehouse built in 1915 probably developed by an advertising executive called I N Bond. That was replaced in 1989 by Pendera a non-market housing building designed by Davidson & Yuen that was part of the Jim Green era Downtown Eastside Residents Association development program. Another of the newspaper buildings clustered around Victory Square, this is the News Advertiser seen in 1900, ten years after it had been constructed on the corner of Pender and Cambie. It cost $20,000 and the business included a bindery run by G A Roedde (you can still visit Mr Roedde’s former home in the West End). The News Advertiser claimed a number of firsts for the city, and possibly the country, including electric powered presses and, in 1893, typesetting machines. In 1910 the paper was sold by its long-time owner Francis Carter Cotton and seven years later the paper was again sold, this time to rival newspaper the Sun. 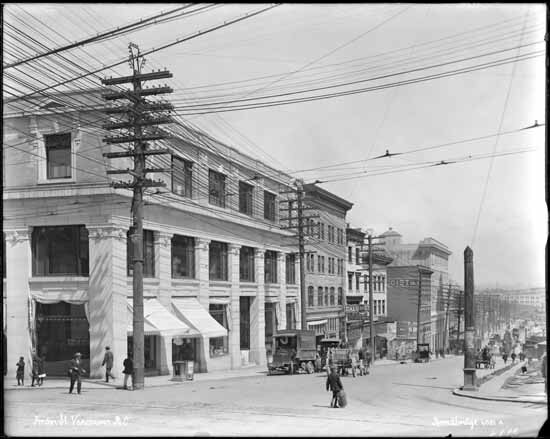 In 1907 the paper move to a new location on West Pender, and three years later a building permit was issued to replace the wooden former offices. Although the new building is often identified with fruit and vegetable dealer H A Edgett, the developer was Francis Carter Cotton, who presumably retained ownership when he moved his paper to its new home beyond the Courthouse. Carter Cotton had built an office building to the north of the site in 1908, and he used the same architect for his latest property investment, A A Cox. The style of the two buildings is complementary, and H A Edgett who occupied it had a storefront on the corner for his greengrocers and furniture store – a somewhat unlikely combination. That’s the store on this 1912 postcard, and the wagons from around the same time suggest the furniture part of the business was equally as important as the grocery. Harry Edgett was born in New Brunswick and arrived in British Columbia in 1890. He was obviously a successful merchant as he was also a director of the Sterling Trust and by 1914 was living in Shaughnessy Heights. The building was adapted in 1924 as the printing works for the Province Newspaper who also occupied the offices to the north and created an arched bridge between the two buildings. These days the Architectural Institute of British Columbia occupy the building after a renovation designed by Peter Busby.